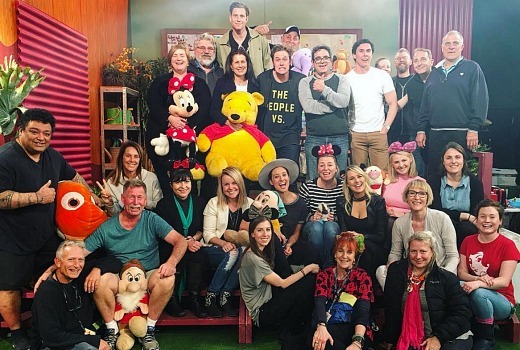 Seven children’s show Saturday Disney is ending after a 26 year run -one of the longest-running kid’s shows in Australia. Two weeks ago hosts Teigan Nash, Candice Dixon and Nathan Morgan filmed their last ever episode. “The places we have been, the people we have met and the memories we’ll never forget! What an epic team! Thank you to each and everyone of you and anyone we have ever worked with!” Nash posted on Instagram. Saturday Disney consists of Disney-produced content and hosted segments with activities such as craft, science, animals, letter of the week, jokes, camping and trips including to the USA, Singapore and more. Over two and a half decades Saturday Disney has been a springboard for the careers of Shelley Craft, James Sherry, Sofie Formica, Jack Yabsley, Mel Symons and Sara Groen. Shae Brewster was the longest-serving host, just short of eleven years. Cost saving decision, no doubt. The big item that killed it was the war between Seven and Nine to ensure that the Sunrise product was every morning of the week so therefore when you do place product on Multi Channels it shows to the people that it is of lesser quality. Having said that it is also the quality of presenters that you have working on the program is also a problem as they haven’t the Calibre of the people mentioned that launched there careers from the show and went on to bigger and better things. Another long running show with a strong brand name gets the boot. I will not be surprised if 7 Network actually rebrand the show and put it on a afternoon timeslot. I remmeber Whats Up Doc being rebranded as the Loony Toons Show and now its Kids WB. Personally 7 should have tried to restructure the show to just include cartoons and move it online if need be as a last resort before axing it. I know kids have largly moved to consuming kids shows via digital platforms but this is IMO a rash decision by 7 executives. Saturday Disney’s finale will be a moment that will get very little promotion by Seven, for it’s significance, especially to a generation that grew up with it being the only FTA source of Disney animated content. I honestly think, the shift to 7Two four years ago and the experiment of splitting childrens content across both 7two/7mate accelerated the demise of a once great program, when Seven could have simply beefed up the brand like Nine did with Kids WB. The demise of Saturday Disney, will indeed be felt by many. Noooo! Saturday Disney has been a part of the weekend for me ever since I was 5 years old. Sofie Formica, Mel Symons, Shae Brewster, Jeniene Mapp, Shelley Craft, Sara Groen and Sally Stanton were awesome presenters. My favourite male has to be the amazing James Sherry. Something must of triggered it for an abrupt cancellation like this. To be honest, when Sunrise commenced on Saturday mornings in 2012 and we were forced to switching from Ch.7 to 7TWO or 7flix now just to continue watching the show, was frustrating probably and the start of its demise. Just hope those working for SD can work in other areas of Ch7 like H&A. What will replace SD after September 24? Will the timeslot just still be Disney themed cartoons and comedies with the SD “wrapper” and segments? The sign of the times. Cheaper to have wall to wall cartoons than to have a presenter in between. Been waiting for GO to do the same.